Pedestrians walk along side a Blue Line train in Downtown L.A.
First off, I’d like to disclose that I’m not a regular Blue Line rider. Nor do I live or work in an area where I have to cross tracks of the Blue Line on a regular basis. I do ride the Blue Line, typically when I make an occasional trip to Long Beach and I do live near a Blue Line station, but it’s the underground station at 7th Street/Metro Center. My observations here come from a few days spent riding the line and walking around the stations and the adjacent streets. This being said, I have tried my best to consider the perspective of someone who interacts with the Blue Line on a daily basis. I’m not a transit engineer nor am I out to place blame. I’m just recording my observations from a pedestrian’s view and sharing them with the hopes that any insights provided may help in preventing future pedestrian harm. As my colleague Steve Hymon noted in his previous post, the Blue Line has had 51 fatal (non-suicide) accidents with pedestrians and despite Metro’s continued attempts to make the line safer, accidents continue to occur. The question, of course, is how does a pedestrian get hit by a train? As we all know, trains operate on a fixed track, pass by at regular intervals and are operated by trained professionals. Avoiding a train is simply a matter of not being on the tracks when a train passes. And yet, in the last 20 years 51 people have found themselves on the tracks as a train passed. A Blue Line light rail vehicle weighs about 47 tons. The average Toyota Prius weighs about 1.5 tons. The Blue Line operates at speeds up to 35 mph on street running sections and 55 mph in some areas. At 55 mph the Blue Line requires 600 feet to come to a complete stop. 600 feet is the length of two football fields. The gauge (distance between the steel rails) of the Blue Line tracks is 4 feet 8 1/2 inches. The width of a car lane along the line is typically about 10 feet. The width of a Blue Line light rail vehicle is around 8.9 feet. The distance between two sets of Blue Line tracks is about 10 feet where trains operate up to 55 mph. What I gather from all this seemingly random data is that light rail trains like the Blue Line are certainly a hulking presence on the street, but their relatively narrow width and the fact that they roll on fixed tracks makes the “danger zone” small and thus they should be easier to avoid than cars when crossing an intersection. A 1996 study on pedestrian walking speeds determined that the average walking speed of pedestrians 65 and older is around 4 feet per second. This means that it takes the average person less that 3 seconds to cross the “danger zone” of a single Blue Line track and about 6 seconds to cross both sets of tracks. Staying safe should be easy. I recently spent some time riding the Blue Line. The following is my observations on a few of the stations and the safety issues involving them. 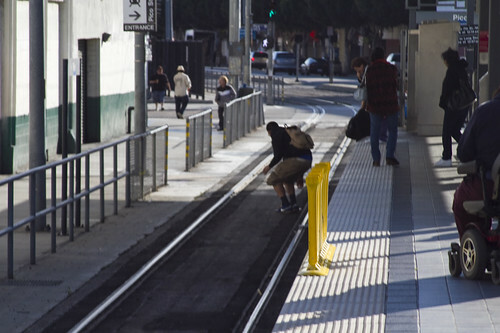 A young man jumps off the platform and onto the track at the Pico Station. 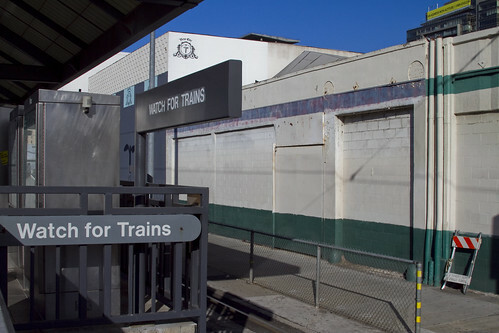 One of the first things I observed at the Pico Station was a young man hopping off the platform and onto the tracks. This guy meant no harm, it was a windy day and a woman lost hold of a piece of paper and he was just being a good Samaritan. But trying your luck with a 47 ton vehicle that takes 600 feet to stop is not worth a few brownie points. Plus, it’s considered trespassing to be on tracks in unauthorized areas. The Pico Station has an almost comical number of safety signs. 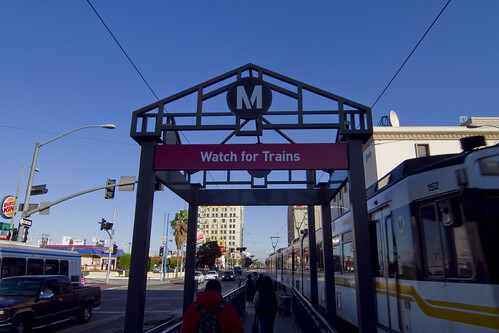 The platform entrances/exits are plastered with unmissable signs that say “Watch for Trains.” There’s a number of signs the remind pedestrians to “Look Both Ways” and others that specify areas where “No Pedestrains” are allowed. The "Watch for Trains" signage is unmissable. Despite this, I noticed a lot of people crossing the tracks in areas clearly labeled off limits to pedestrians. A fence runs along the east side of the tracks. There are two gaps in the fencing at the south end of the station. One is clearly labeled as the entrance and the other gap, there to provide auto access to an underground parking garage for a private business, is labeled “No Pedestrians.” Entering through the marked entrance allows pedestrians to cross the tracks perpendicularly, making it past the “danger zone” in as little time as possible. Crossing through the other gap leads pedestrians on a 50-foot walk down the center of the tracks to the entrance. I saw a large number of people entering and exiting the platform in this manner. Pedestrians exit the platform incorrectly and walk down the tracks. The Grand Station exit is clearly labeled with "Watch for Trains" signage. The Grand Station, and subsequent stations on Washington Boulevard are situated in the middle of the street, which happens to be a rather busy four-lane street. The platform exit leads to a small but distinctly marked zone between the tracks where pedestrians must wait for a walk signal to cross the intersection. 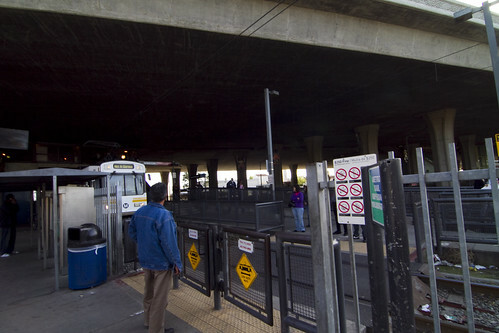 These waiting areas are a great place to get a sense of the sheer size and speed of the light rail vehicles – you really do not want to get in front of one of these trains. Most everyone seemed to obey the rules at this station, but I did notice a number of people running towards the platform entrance – clearly not wanting to miss their train. I did notice one man cross the intersection diagonally and very illegally. The reason became clear as I attempted to cross the street myself. The crosswalk signals seem fast. The walk signal lasts 25 seconds, and the countdown to the red light starts after about 7 seconds. If I began crossing the instant I got the walk signal, the countdown would begin before I was at the first set of tracks. Just like cars will run red lights, pedestrians will walk against red signals – and such quick signals seem to encourage this behavior. 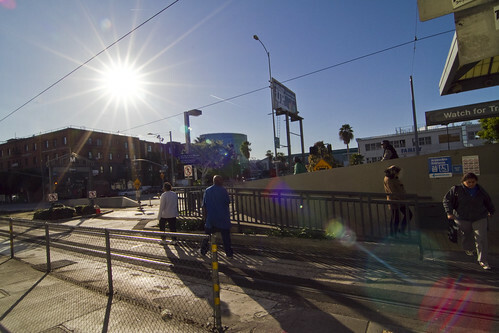 I observed many people at the San Pedro Station crossing the track illegally due the long wait for a walk signal. 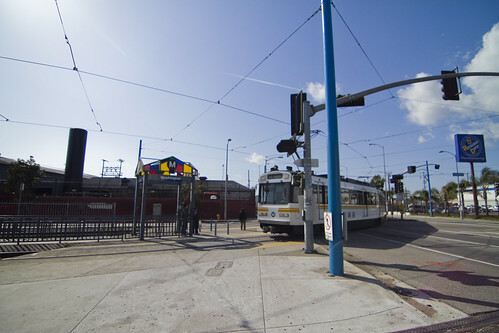 The San Pedro Station is also in the middle of Washington Boulevard. 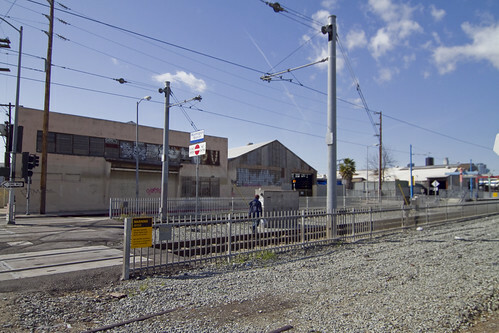 I noticed many people crossing the tracks and street illegally here, sometimes waiting on the tracks looking for a clearing in automobile traffic. When I attempted to cross, I saw why people were desperate to cross illegally. The cross signals were very unresponsive, typically taking 1 minute and 35 seconds after pressing the button to generate a walk signal. I could see the impatience grow, especially as traffic cleared but the red signal remained. Again, the crossing signals seemed to encourage dangerous and illegal behavior. A Blue Line train rounds the curve as it enters the Washington Station. 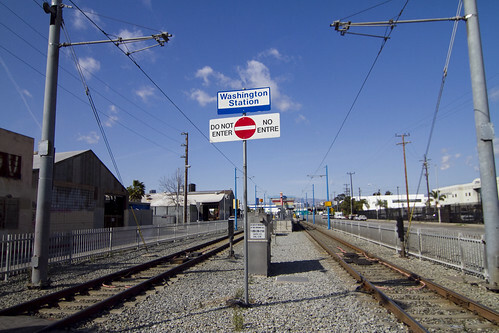 The Washington Station is located where the Blue Line turns south from Washington Boulevard onto Long Beach Avenue. Auto traffic seems much calmer around this station but the surrounding industrial warehouses and parking lots nonetheless give this station a vibe that isn’t neccessarily welcoming to pedestrians. There are gates, bells, and flashing signals at the intersection of Long Beach Avenue and 20th Street which certainly make it abundantly clear when a train is approaching. The sidewalks near the intersection of Long Beach Avenue and 20th Street are in terrible condition and very unwelcoming for any type of pedestrian. 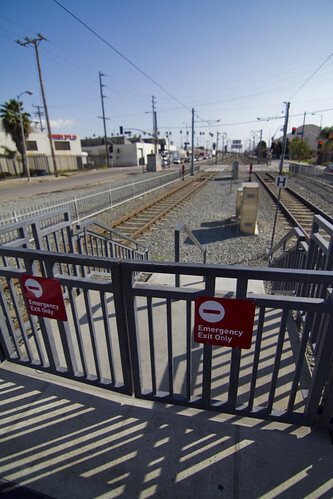 At the south side of the platform there are a pair of gates clearly labeled “Emergency Exit Only.” Beyond the gates is a small staircase leading down to the tracks which are surrounded by fences for about 130 feet until the intersection of Long Beach Avenue and 20th Street. Despite the “Emergency Exit Only” signage and a “Do Not Enter” sign, I witnessed many people exiting and entering the platform via these stairs, often walking on the tracks (sometimes biking) for quite some time. Staircase at end of the Washington platform, many pedestrains enter here despite signage. Looking down towards the above staircase from the intersection of Long Beach Ave./20th Street. Note the signage. A pedestrain enters the Washington Station illegally, walking near the tracks an well within the "danger zone". A cyclist enters the Washington Station illegally, coasting right by a "Do Not Enter" sign. The Vernon Station has many safety devices in place. 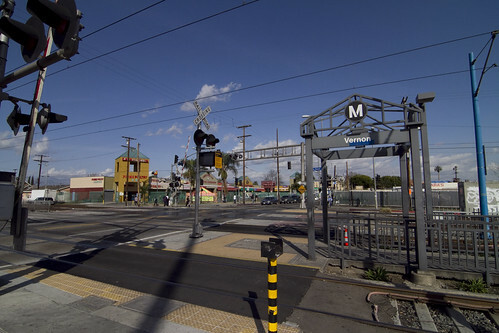 At Long Beach Avenue and Vernon Avenue pedestrians wishing to cross the street must cross four sets of tracks – two Blue Line tracks and two Union Pacific freight tracks. This station has a plethora of safety devices – crossing gates, bells, flashing signals, fences, signage and even a flashing LED sign that reminds pedestrians to look both ways as a train is approaching. Although the pedestrian crossing signals at this intersection seemed very responsive, I still saw some kids crossing against a “Don’t Walk” signal. The Florence Station features signage, gates, bells and flashing signals. Despite being very busy and crowded the Florence Station felt safe and I didn’t observe any illegal behavior. This section of the Blue Line also shares the right of way the the Union Pacific Freight trains, meaning there are four tracks to cross. However, since there is no auto traffic running alongside the tracks in this section, the crossing is much shorter and less busy which probably contributes to the pedestrian friendly vibe this station has. This station also features many safety features and signals that make it virtually impossible not to know when a train is approaching. 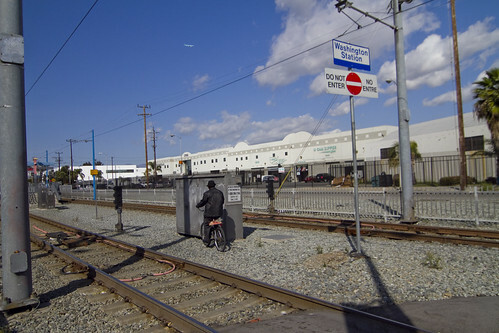 This station was similar to the Florence Station – it features a shared right-of-way with Union Pacific freight tracks but there is no auto traffic directly adjacent to the tracks. Again, I got an overall safe feeling from this station, likely because of the lack of cars running alongside the rails. 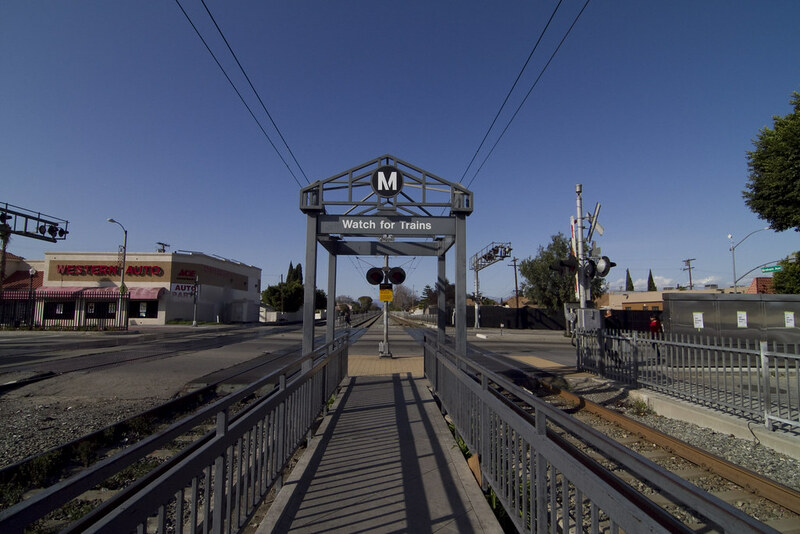 I chatted with some students who lived nearby and are regular weekend Blue Line riders. They were surprised to hear that people have been harmed by the Blue Line, stating “It’s a train, how do you get hit? Just stay out of the way!” When I asked them if they ever found getting to Blue Line platforms confusing or dangerous they told me that the Blue Line was easy to figure out, it’s the subway that they found confusing. They were also very excited about the prospect of being able to ride a train one day to the Westside. The Imperial/Wilmington Station seems very safe for pedestrians, but these ticket machines do create a small blind spot for spotting approaching trains. The layout of this station is a bit different: It’s situated under the 105 Freeway and riders can transfer to the Green Line above. I found crossing the tracks at the station to be very easy and safe so I ventured out a little further to check out the nearby crossings. 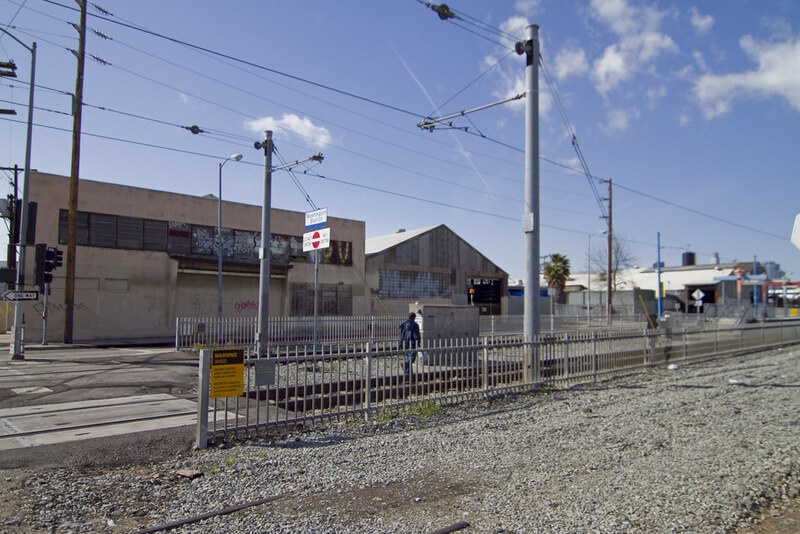 Despite an inordinate amount of trash and filth littering the area around the tracks, the at-grade crossings looked safe with bells, lights, and pedestrian swing gates. This is one of the stations that has seen considerable safety upgrades over the years. There was only one spot at the station where I noticed a potential blind spot where from some angles the ticket vending machines seemed to make it hard to see if a train was approaching. However, the bells, lights and horns do provide plenty of warning. I didn’t observe any illegal or dangerous behavior of note at this station. The right of way in Long Beach features median fencing and landscaping which makes the streets friendlier for pedestrians. 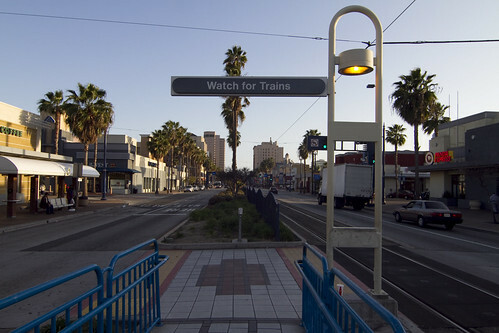 In Long Beach, the Blue Line returns to street running and slows down to maximum speeds of 35 mph. The streets here seem much friendlier to pedestrians than the street running sections of Washington Boulevard. A fence and landscaping runs down the median of Long Beach Boulevard which has the effect of making the street seem narrower and calmer, as well as discouraging illegal jaywalking. The fence is one of the safety improvements made along the line. Pedestrian crossing signals here beeped and spoke, letting pedestrians know when they have right-of-way. I didn’t observe any illegal or dangerous behavior here. I certainly observed a lot of risky and illegal behavior on my Blue Line journey and I would attribute much of it to a lack of respect for deadly power of a train vehicle. 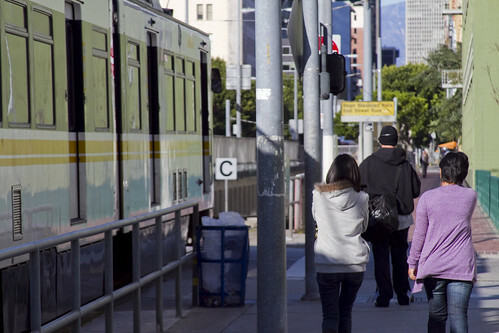 I rarely see pedestrians walking up the middle of a city street, ]but I definitely saw people doing just that on the train tracks – and there’s really no compelling reason to do such a thing. One just has to stay clear of the 9-foot “danger zone” that represents the width of a light rail vehicle in order to spare their life. When it takes the average pedestrian less than 3 seconds to go 9 feet, sacrificing that shortcut to save one’s life is not really that big of a trade off. That being said, I also noticed general environmental factors that could encourage these risky behaviors, much of it having to do with L.A.’s historical preference of favoring the automobile over the pedestrian. I believe creating pedestrian-friendly environments around our at-grade light rail stations — even if it means inconveniencing motor traffic — would encourage people to act more safely around trains. L.A.’s historical preference of the automobile also leads us to a grizzly truth: the number of pedestrians killed by the Blue Line in the last 20 years pales in comparison to the number killed by cars every year in L.A. According to the California Highway Patrol, in 2008 there were 214 fatal pedestrian collisions on Los Angeles County roads. Remember, there have been 51 fatal pedestrian collisions with the Blue Line in 20 years, that averages out to less than 3 deaths a year. This is not to say that’s acceptable, but it is about 71 times less than have been killed on L.A. roads. Of course, the Blue Line is only 22 miles long and and L.A. county’s 4,752 square miles is covered with autoroads – but to me, a death is a death and vehicle miles traveled is really irrelevant to the individual and their loved ones. Consider this fuzzy math though: if 22 miles of the Blue Line has 3 fatal pedestrian collisions a year, L.A. would need about 1, 562 miles of light rail to match the danger of our preferred mode of travel. FYI: Metro’s a long way from building 1,562 miles of at-grade light rail. On point I’ve neglected is the 22 suicides along the Blue Line. These incidents, while unfortunate, are not unique to at-grade light rail. In New York City there were 343 suicides over a 13 year period on the fully grade-separated subway system. Finally, I want to say this. Los Angeles is hardly the only city in the U.S. or the world to have trains running on its streets — in the American west street-running trains are found in Seattle, Portland, San Francisco, San Jose, Sacramento, San Diego, Salt Lake City, Phoenix and Denver. In Europe, at-grade light rail is even more prevalent, and the hulking light rail vehicles often travel through crowded city centers teeming with pedestrians in numbers simply not seen in the U.S.
A few years ago I spent some time in Bordeaux, France, and had the chance to interact with the city’s beautiful light rail system, the Tramway de Bordeaux, which consists of three lines that carry upwards of 165,000 passengers daily and travels through some very densely populated areas. The system is probably one of the best public transit systems I’ve ever been on – it seamlessly integrates with the city and becomes a natural, quiet and stylish way to get from point A to point B. 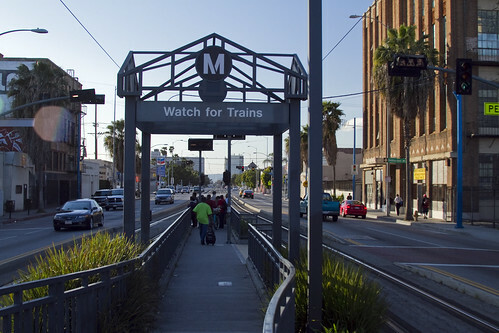 Let us know what you think about the Blue Line and at-grade light rail safety by emailing us at thesource@metro.net.